Total Home Protection provides fast, effective, industry-leading home warranty protection with a network of trusted contractors. The website does have that landing page feel, with some of the information presented perhaps a little too simply. You have to dig deeper to find more detailed information. 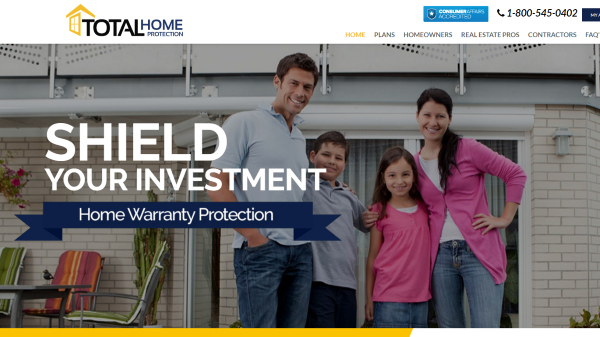 The first time you land on the Total Home Protection site, you are greeted with a very bold, sometimes brash, layout. That said the site’s design matches the style of the cover - unfaltering, strong and powerful protection for your home appliances and systems. But it could be a little intimidating and maybe even appear pushy or overbearing for some customers looking to make a more considered application. However, all the help and support is on hand should you want it, with a live chat functionality, that’s less hidden away in the corner or bottom bar like other providers, but instead popping up right in the middle of the screen after a few seconds. This can get annoying as it does tend to keep popping up even if you close or minimize. They do have a direct dial number though, which is a good way to bypass this. Total Home Protection obviously have its customers’ needs in mind, but because the site seems a little overbearing and pushy, this can affect how it’s perceived. It can feel a bit too salesy in places, and some customers may feel they’re being pushed into going through certain steps before they’ve found out more information. That said, there is a lot of information on the site, and it is clearly laid out in the navigation. Whether you’re a homeowner, real-estate pro, or contractor. All pricing information is laid out clearly on the pricing page, with a straightforward table to see what each package covers. There are also easy links to get a free quote, and details of the free month’s cover. Some of the content does feel a little too brutal, and light in detail though. There is a sense here that you don’t always get the full picture upfront. The warranty cover from Total Home Protection is, as the name suggests, comprehensive. And yet, it’s still clearly designed to be affordable and made to suit a range of budgets and customer needs. The three packages - Gold, Platinum, and Optional will cover pretty much everything both the average, and not-so-average home is looking for. It’s also reassuring to know that your service agreement from Total Home Protection will cover repair or replacements of covered items, regardless of age, make or model. It would be good to get a firmer idea of prices upfront on the site though, even just a ballpark, so people could make an informed decision on their own before calling the sales or support team. As with many home warranty sites, the terms are usually hidden away where they’re a bit harder to find. Total Home Protection is no different really. Plus, the nature of the look and feel of the site, and the tone of voice it uses, could put people off and intimidate them into perhaps getting in touch before they have the full picture. What is good though, is they do have a useful section in the footer with a menu linking to more information about the warranty. From what’s covered, to warranty benefits, to claim status. Many will find this a good way to present key information that forms part of the terms and conditions. It goes without saying, that any warranty provider as committed to cover as Total Home Protection obviously is, needs a network of contractors to back it up. Despite the brand’s bravado, it’s clear that it is really switched onto having the necessary trained individuals and teams on hand to help whenever they’re needed. What’s really great, is it has a page dedicated to contractors, something that many providers don’t have, and often even fail to go into such detail about. Although this is strictly designed for contractors looking to join the team, it’s obvious that it’s there to show customers its commitment to vetting, training and monitoring contractors in its network. If you can look past Total Home Protection’s shtick, and take its brash brand and overall concept with good humor; you’ll find a solid home warranty provider here. One that’s obviously stood the test of time, and committed to providing comprehensive, affordable protection.